The national dish is one of much admiration. 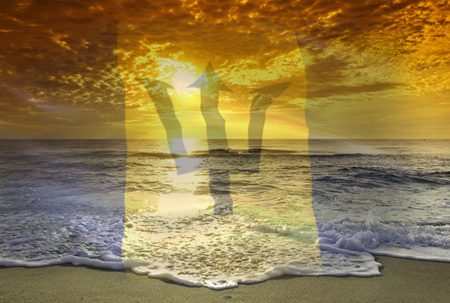 Folk songs, restaurants, books and other Barbadian-born ideas have borne its name, and the dish has even gained international acclaim as it was rated third on the National Geographic list of top national dishes! It is essentially Barbadiana on a plate, marrying a bit of African heritage in the form of the cou-cou, and celebrating the island’s fertile waters with the tasty flying fish. The meal starts with seasoning and steaming the fish to create a broth filled with aromatic vegetables and rich flavour. Then, the cou-cou begins by boiling okras in water to create what Barbadians call ‘okra slush’, then add the corn meal flour and stir (salt is also added along the way.) The task of rendering the cou-cou into its final, creamy state is not a simple one, and is usually achieved with the help of a cou-cou stick - a wooden kitchen utensil that can only be described as a miniature cricket bat! 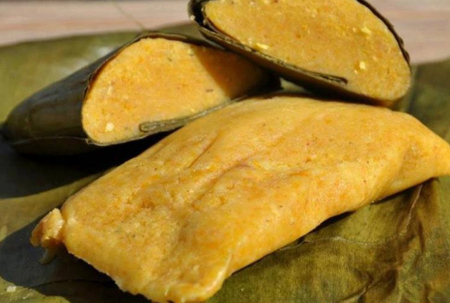 While the authentic cou-cou that accompanies the flying fish is corn meal, many also choose to switch it up by opting for breadfruit, yam or green banana versions - all of which are equally enjoyable! Another traditional Barbadian dish, conkies were originally associated with the old British colonial celebration of Guy Fawkes Day on November 5. But, for the past five decades, the dish is now a staple during the island’s Independence celebrations. This sweet treat is known to older Barbadians as ‘stew dumplings’ and is one of the most requested dishes around independence. A skilled group of home cooks across the island religiously take on the task of creating these hand-sized delicacies, and the preparations usually turn into a group effort that involves the whole family. The most authentic way of making conkies is grating fresh sweet potato, pumpkin and coconut by hand, adding the corn flour, fat, currants, wet ingredients and spices and mixing until a rich pumpkin-hued batter is formed. Newly-cut banana leaves are singed over an open fire, and used as the wrapper for the final stage of preparing the conkies. They are then steamed, cooled and served to all who were involved in the preparations! 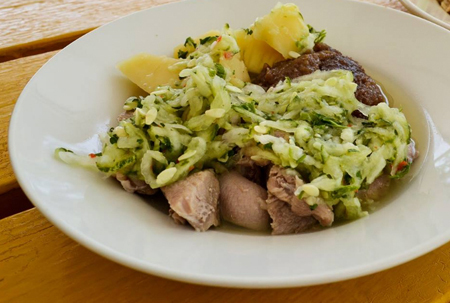 Barbadians are known for their love of pork, so it is no surprise that pudding and souse has remained on Barbadian tables and menus for centuries! 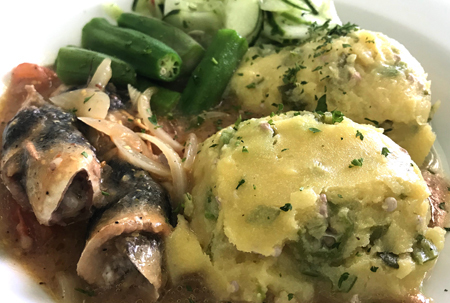 Typically made and served on Saturday, pudding and souse is a dish that is as colourful in its presentation as it is in its history. The souse element of the dish is usually pork that has been pickled using onion, cucumber, lime juice and pepper. The cuts of pork that are used are varied, but more often than not include pigs’ feet and in some cases ears; however, for the healthy eaters and faint of heart, there is now the option of lean souse, which is essentially regular filets of pork versus the traditional fatty, gristly sections. As with cou-cou, there are two variations of pudding - black and white. The basic form is white pudding, which is essentially a mixture of grated sweet potato, herbs and spices that was traditionally encased in the lining of the pig’s intestine and steamed. To achieve the black version, pigs blood was added to the basic mixture, giving it a deep, brown hue. These days, the intestinal lining is rarely used, and to achieve black pudding, the blood has been replaced by food browning which is bought at local supermarkets. 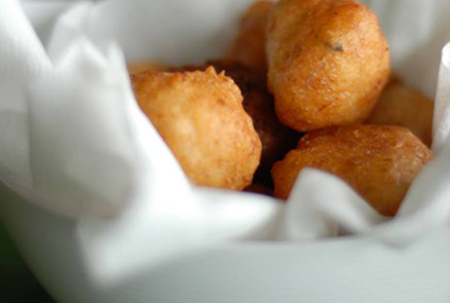 Salted meats are a staple in Barbadian cooking, but none graces Barbadian taste buds more often than salted cod fish. Found in virtually all supermarkets and meat markets across the island, salted cod is actually the foundation of the ever-popular fish cakes - a quick-to-prepare, fried delicacy that Barbadians enjoy year round. Their golden, crunchy exterior gives way to a soft, well-seasoned centre that is usually dotted with salted cod fish, thyme leaves and red pepper flakes. Although each household has their own tried and true recipe, fish cakes are typically made with salted cod, flour, baking powder, chives, thyme, onions and local pepper sauce. And, there are just as many ways to eat them as they are to prepare them. Enjoy them with a local bun known as a salt bread, or marry them with some nice, homemade Bajan bakes which bring a hint of sweetness and nutmeg to the palate! With so many recipes now available online and simple yet rich ingredients that are readily available, recreating these Barbadian dishes is very straightforward. However, there is always the option to leave it to the experts by supporting popular spots and restaurants with the best of the best on offer!